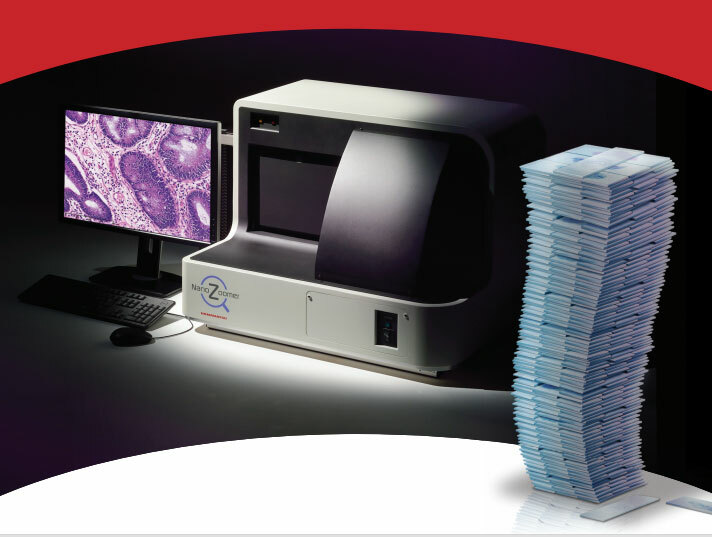 NanoZoomer S210 combines our established scanning reliability for large batches of slides with outstanding image quality in the fields of research, pharmaceutical, healthcare and archiving applications. Quick and easy slide loading of up to 210. The outstanding reliability and robustness that results in high whole slide creation rates is proven by almost a decade of experience supplying the NanoZoomer S210 to many high throughput and demanding environments. The proven intuitive user-interface makes all the benefits and capabilities of the system available to everyone in your team with a minimum of training. Outstanding image quality and z-stack capability. Quick and easy loading of slide cassettes for up to 210 slides. 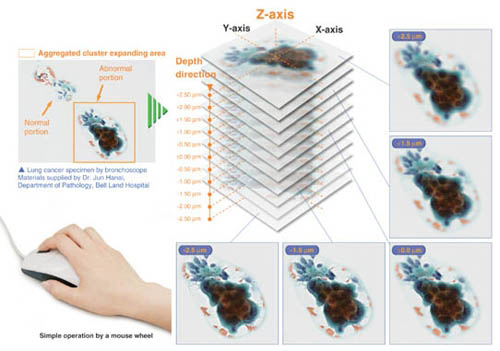 The Z-stack function of the NanoZoomer S210 allows whole slide multilayer scanning with the subsequent advantage to navigate through multiple focus planes. Flexible integration into different environments based on plug-in modules and communication interfaces to enhance the whole slide imaging workflow. 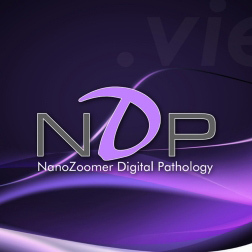 NDP.scan: The software solution for converting glass slides into digital whole slides images using the NanoZoomer series scanning devices. NDP.scan is a user centric intuitive dynamic interface that controls the whole scanning process. The scanning software has the flexibility to offer fully automated batch slide scanning with the possibility to change all aspects of the scanning parameters in real time to cover all user application requirements. NDP.scan has a short and shallow learning curve due to its intuitive design making the system scanning capabilities accessible to a new user within minutes. Multiple users can share a scanner using the profile function. 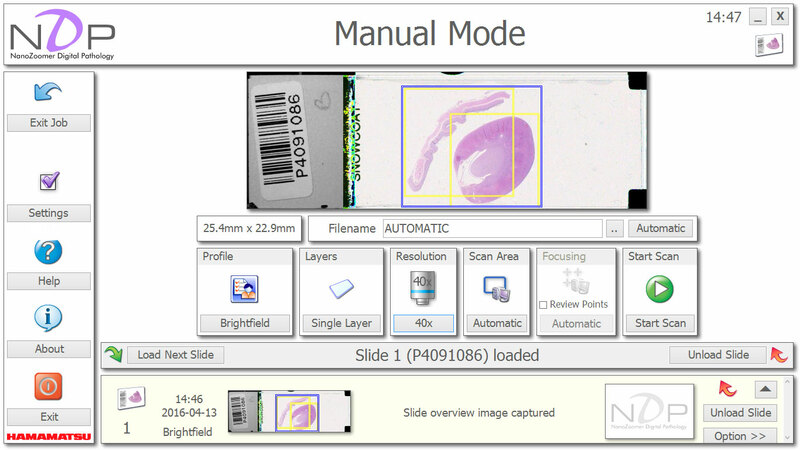 Each user can set up their own profile, such as scanning parameters and slide storage area. The profiles can be used to keep scanning parameters for various types of samples. 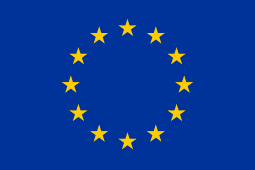 Highly flexible and adaptive workflow using pre-configured parameter settings within user profiles to achieve even higher scanning success rates. 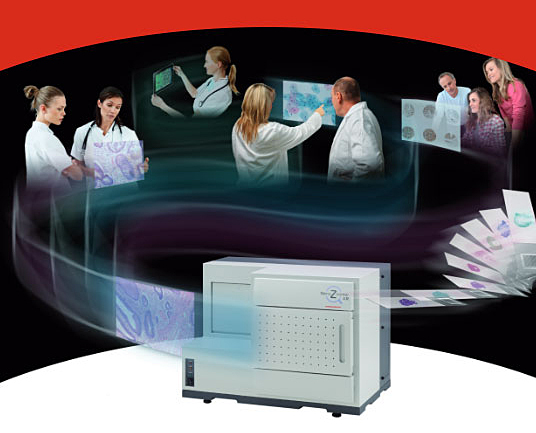 Different modes of scanning – from manual scanning of a single slide, to scanning large batches fully automatically – giving the flexibility needed to adapt to a wide variety of requirements. NDP.scan can be easily linked to external databases such as LIMS/LIS, to communicate and retrieve barcoded scanning information to realise a fully automated scanning setup. Sharing and viewing NanoZoomer whole slide images is simple and easy with our free NDP.view software. 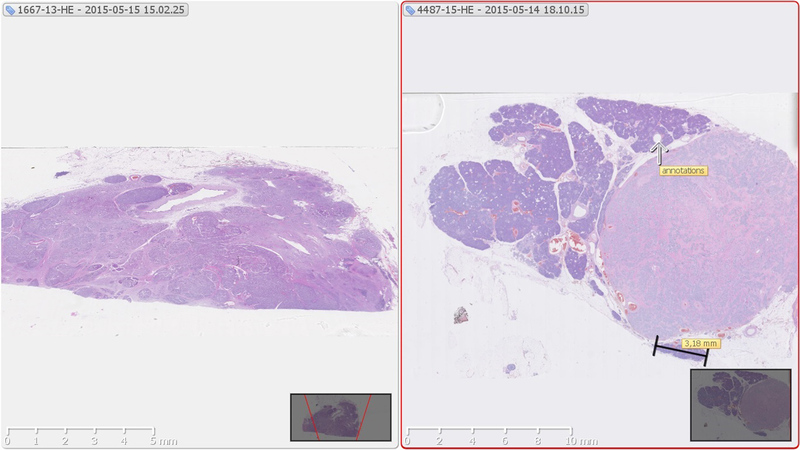 For the first time in the whole slide imaging market, the latest version of NDP.view delivers the possibility to observe digital images as smoothly as you would viewing with a microscope. The new viewer takes the smooth nature of a microscope experience and combines this with the benefits of digitized whole slide images. Mobile viewing is possible with the NDP.serve software that is based on an Ajax Viewer. The full screen display gives a clear view of the image without being cluttered by unnecessary tool bars and windows. Advanced interface for a more responsive and smooth panning, zooming and focusing functionality via the mouse, keyboard or other devices. A full display of clean slide view, by eliminating unnecessary control windows, let’s you concentrate on your work. NDP.view also offers: morphometric measurements, flexible annotations, export functions into different image formats and extended image control. NDP.view is the first viewer in the world offering a “birds-eye-view”. Reading files from different scanners. Additional functions allow counting and measuring. NDP.serve: Our core technology serving software to deliver and manage whole slide images throughout a network, in conjunction with LIS/LIMS and other database solutions. A powerful solution to manage and organize your whole slide images. NDP.serve combines the capabilities of Hamamatsu scanning devices with an open software architecture to deliver the world of whole slide images throughout networks to people around the globe. Secure WSI data management and distribution services allow for quick and easy remote accessing and viewing of the images to enhance application workflows, ideal for for Teleconsultation. NDP.serve provides whole slide images to any browser running on client hardware – this can be either PC, MAC, iPAD, Smart-Phones and other mobile devices – without the need to install local software, avoiding IT security issues. Ease of use software interface to manage slide data, administrate user groups and serve whole slide images within local and global networks. NDP.serve is able to interface easily with a broad range of external data bases such as LIMS and LIS to merge different types of data. No user and slide limitation and easy to expand with additional functionality like the NDP.Conference plug-in module.